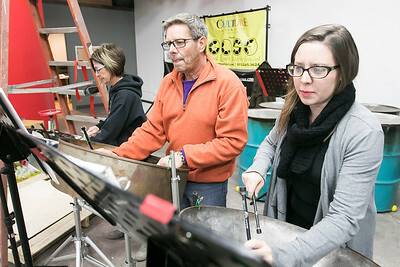 Sarah Nader- snader@shawmedia.com Elizabeth Penn (left) of Johnsburg, Steve Houston of Crystal Lake and Amanda Krzyzak of Wonder Lake play during steel band rehearsals Tuesday, Nov. 22, 2016 in Woodstock. The non-profit, Culture, Arts and Music, is having a grand opening of its organization and expanded space in Woodstock. Culture, Arts and Music’s mission is to ”bring the world to McHenry County” by allowing people to experience different cultural actives such as salsa dancing and playing the steel drums. Sarah Nader- snader@shawmedia.com Co-founder of Culture, Arts and Music Anthony Jay Houston of Crystal Lake plays the drums during steel band rehearsals Tuesday, Nov. 22, 2016 in Woodstock. The non-profit is having a grand opening of its organization and expanded space in Woodstock. 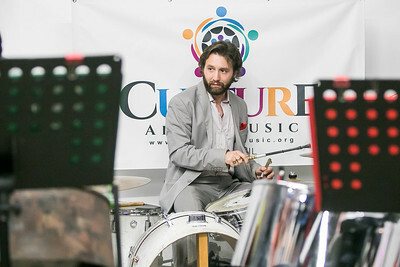 Culture, Arts and Music’s mission is to ”bring the world to McHenry County” by allowing people to experience different cultural actives such as salsa dancing and playing the steel drums. 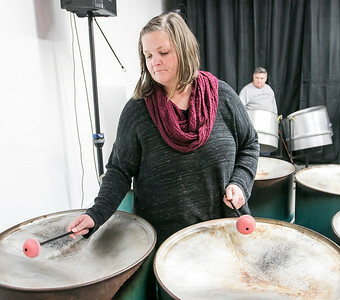 Sarah Nader- snader@shawmedia.com Vicki Cummings of McHenry plays during steel band rehearsals Tuesday, Nov. 22, 2016 in Woodstock. The non-profit, Culture, Arts and Music, is having a grand opening of its organization and expanded space in Woodstock. Culture, Arts and Music’s mission is to ”bring the world to McHenry County” by allowing people to experience different cultural actives such as salsa dancing and playing the steel drums. 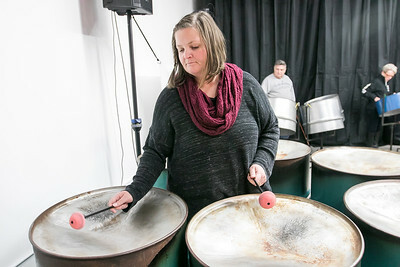 Vicki Cummings of McHenry plays during steel band rehearsals Tuesday, Nov. 22, 2016 in Woodstock. The non-profit, Culture, Arts and Music, is having a grand opening of its organization and expanded space in Woodstock. Culture, Arts and Music’s mission is to ”bring the world to McHenry County” by allowing people to experience different cultural actives such as salsa dancing and playing the steel drums.